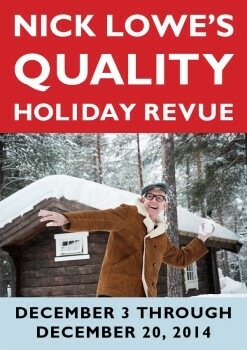 Nick Lowe is proud to announce Los Straitjackets as the backing band for his first-ever holiday tour supporting his acclaimed album Quality Street: A Seasonal Selection for All the Family. “I got a tantalizing taste when I played with them at the Yep Roc 15 celebration, and now I’m returning for a full meal” says Nick. Released in 2013, Quality Street was the most acclaimed holiday album of the year. Dubbed a “sleigh bell-free zone” by Lowe, the album was hailed as “characteristically great” (New York Magazine) and “unimpeachably tasteful” (Washington Post).